It may come as a shock to people of my generation and younger who grew up in a time where Woody Allen has released a string of substandard product, from Melinda & Melinda to Scoop to The Curse of the Jade Scorpion, to encounter the greatness of his early work for the first time. His most recent film, Midnight in Paris may have brought back a glimmer of his former glory, but nothing really comes close to those early works for sheer wit and intellectual comedy. Annie Hall may be known by legions of Star Wars fans as "that movie that beat Star Wars for Best Picture" in 1977, but as great as the original, pre-Lucas rejiggering Star Wars is, Annie Hall absolutely deserved its win. It's not only Allen's finest film, it's one of the finest films of the 1970s. 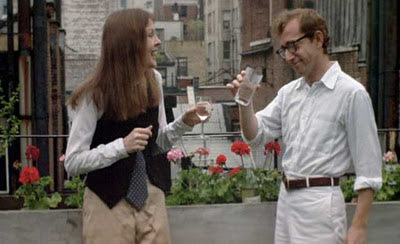 Allen made lots of very good films, but he never quite surpassed Annie Hall, which would go on to be regarded as his seminal masterpiece, the most pitch perfect evocation of his own particular brand of self-deprecating neurosis. Allen plays one of his endless variations on himself, but of all his roles this one seems to strike the closest to home. That's one of Annie Hall's most enduring qualities. It's clearly a deeply personal work for Allen, almost autobiographical in its evocation of his worldview. His love affair with the titular Annie Hall (Diane Keaton) remains one of the most piercing studies in romantic dissolution ever committed to celluloid. Allen had a keen insight into what makes relationships work (or in this case, not work), and the clear incompatibility of these two people is both poignant and hilarious. Allen carefully deconstructs their tentative courtship into strikingly perceptive observations on love through wry, self-reflexive comments and fourth wall breaking that almost seemed to acknowledge the sheer movie-ness of what we're watching. Subtitles tell us what the characters are actually thinking even as they say something else. Allen has shockingly honest conversations with strangers that reflect underlying reality more than natural conversation. Annie Hall is a film about everything that goes on underneath the surface, about everything that goes unsaid in a relationship where more open communication could prevent conflict (or perhaps create all new ones). 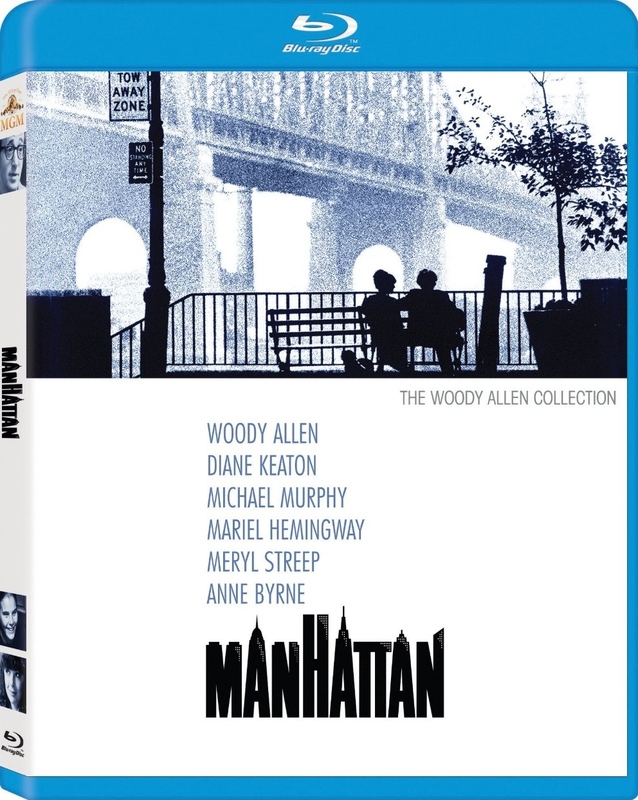 Two years after Annie Hall, Allen made Manhattan, which could justifiably be called the quintessential New York movie. While New York acted as Allen's muse for decades before he discovered London in Match Point, Barcelona in Vicki Cristina Barcelona, and Paris in Midnight in Paris, never did it feel so exalted, so vibrant, so alive as it did in Manhattan, which is a big glowing valentine to the city Allen loves the most. While the film still centers around a neurotic nebbish with love problems much like Annie Hall, Manhattan is less about the relationships as it is the city itself. This time Allen stars as Isaac, a writer who's in love with two women - a sweet but naive 17 year old girl (Mariel Hemingway), and a much more worldly fellow writer his own age (Diane Keaton). Having just emerged from a messy divorce, his ex-wife (Meryl Streep) is now writing a tell-all book about their relationship and her subsequent turn to homosexuality. Manhattan doesn't quite have the same kind of comedic inventiveness of Annie Hall, but it isn't really meant to. There's something more romantic about it, and in some ways more naive. It's an Allen fantasy, less cynical perhaps than his other films, because it allows Allen to focus on something he loves even more than himself - New York City. The gorgeous black and white photography (and that swinging Gershwin score) recalls the smoky images of a New York that existed perhaps only in portraits on a wall, but it also evokes the way its lead character, and by proxy Allen himself, views the city. Every nuance, every rhythm, is perfectly in tune with the hum and verve of the city, at least as it exists in Allen's mind. Manhattan is the film that benefits the most from the blu-ray upgrade, and Fox wisely chose to preserve is wonderfully grainy quality. They've enhanced the lovely use of light and contrast while maintaining its film like fuzziness creating something gorgeous and evocative. This is Manhattan as it was always meant to look, and it's simply stunning. Annie Hall has also received a much needed clean-up. And while it was never a particularly visual striking film, the HD makeover has cleared away some of its more obvious age. The only issue here is the complete lack of extras on both discs, a shame considered both films' place in film history. With Allen back in the spotlight again, one would think now would be the perfect time for some new making of documentaries and retrospectives on Allen's prolific career. Alas, we are left with these bare-bones blu-rays that, while making the films look better than ever, have missed an opportunity to deepen our understanding and appreciation of these seminal works. 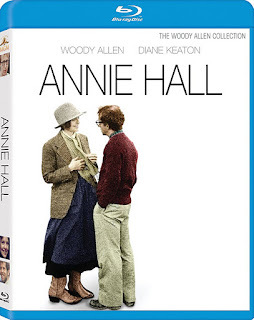 The films themselves, however, remain masterpieces; and with Annie Hall in bad need of a clean up and Manhattan never looking more beautiful, it's hard not to recommend these two discs to both longtime Allen fans and newcomers to his work, who I think will be pleasantly surprised by singular wit and sophistication of the director's more accomplished early work. Now available on blu-ray and DVD from 20th Century Fox and MGM.